Donald Trump may have reason to gloat on Twitter again about the latest troubles facing Macy's -- the iconic retailer that dumped Trump's clothing line last year. Macy's reported sales for the first quarter on Wednesday that fell more than 7% from a year ago and missed forecasts. The company also lowered its sales and earnings outlook for the year. Same-store sales -- a key measure of financial health at retailers that looks at sales for stores open at least a year -- have now fallen for five consecutive quarters. Macy's (M) stock plunged nearly 15% to a 52-week low on the news, wiping out the stock's year-to-date gains in the process. In January, Trump pointed out in a tweet that Macy's was one of the worst stocks in the S&P 500 last year, adding that it was a "very disloyal company." He urged his backers to boycott the retailer. Maybe some Trump loyalists are doing just that. But Macy's has bigger problems than the presumptive Republican presidential nominee. 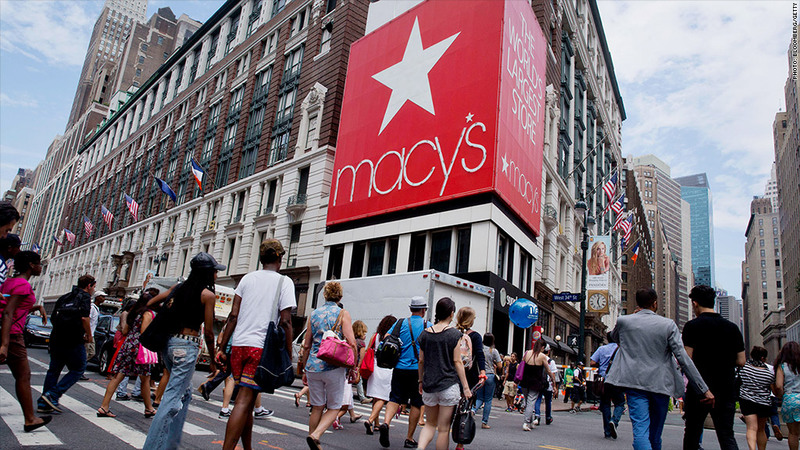 Macy's CEO Terry Lundgren said in a statement that international shoppers are not spending as much at some of the flagship Macy's and Bloomingdale's stores in New York and other big tourist spots in the United States. It also has to shake off the notion that it is a stale franchise. Macy's admitted in its release that it needed to "excite customers with greater newness and more exclusive merchandise." The company is partnering with Elton John and Lady Gaga on a new clothing and accessories line called Love Bravery. It also plans to have more gadgets from Samsung and Brookstone in stores in time for the holidays. With that in mind, Lundgren expressed hope that Macy's could "make up some ground in the months ahead" but still felt the need to lower its guidance for the full year based on current sales trends. But Macy's -- like many traditional retailers -- faces a difficult challenge. Fast fashion upstarts like H&M and Zara are eating into its apparel sales. Macy's is trying to fight back with its own discount stores called Backstage. It's a strategy that has worked for Nordstrom (JWN), which has its own discount outlets called Nordstrom Rack. Macy's is also focusing more on cosmetics -- it bought Bluemercury last year -- as well as jewelry. Still, will that be enough to resurrect Macy's? Cowen analyst Oliver Chen noted in a report that the company's inventories -- while down from a year ago -- did not fall as much as sales did. That means Macy's needs to do more to freshen up the products it has in the stores. Macy's also has an activist shareholder -- Jeff Smith of Starboard -- pushing the company to do more with its real estate holdings to try and increase the stock price. And the company has to contend with Amazon, which is becoming increasingly dominant in the overall retail landscape. Amazon (AMZN) shares hit a new all-time high on Wednesday. Lundgren didn't mention Amazon specifically by name in the Macy's earnings release. But he didn't have to. It's clear that Macy's recognizes the threat from Jeff Bezos' online retail giant. Macy's said it planned to invest more in enhanced online customer support and increased digital and mobile shopping functionality. And it's doing that while it continues to shut down some underperforming brick and mortar stores.